I need a time machine! I would like to whisk back in time to another era and have a look around. What was there, what wasn’t how can I describe the place so others can see it as it was in a time passed? I looked on Ebay and Amazon – no time machine suitable to take this storyteller back to my great grandparents era and before. A recent day off helped me though and I realized what a treasure of time travel was at my fingertips. I was out with my husband, a rare few hours off together. We went to a nice lunch then stopped to browse the offerings of a favorite antique shop, Sturbridge Antiques. We weren’t looking for anything particular, just wandering. 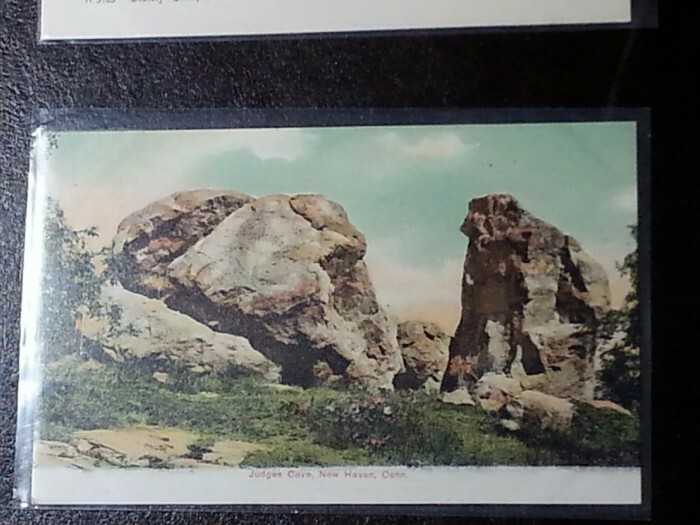 I stopped at a booth, on a shelf, boxes of neatly organized old postcards were offered and I began to thumb through. There was my time machine! In a few minutes time I was whisked from the hills of the Badlands to the great monuments of Europe, from the streets of New York City to a back country farm of yesteryear. Then I hit the right file. I lifted a card from the Connecticut file. The Judges Cave in New Haven, my Uncle had written about that cave in his papers. He had told how a Native American servant of his mother’s visited her father there, he was living in the cave at that time in the 1840’s. Here it was, not as it is today but a view from much earlier, a glimpse of a past I could not see. I set the card aside and continued to go through the file card by card. I couldn’t wait to see what other treasured image from a family story I might find. There were churches galore, and Main Street America in resplendent glory, depicting antique cars and stately Elm trees. I found farm scenes and business cards. 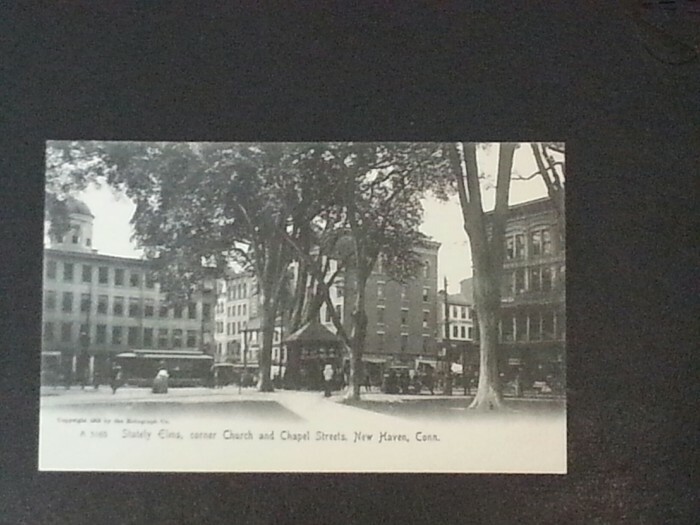 Then I lifted this card from the file, the corner of Church and Chapel Street in New Haven dated 1905. This was one of his haunts! On the third floor of that building in the card he began his adult life as an apprentice to the ships carver. 1905, he was an old man by then, but indeed would have known this view of New Haven! Uncle George was born in 1835 in New Haven, he saw a lot of changes in the city. Through these simple postcards I can witness the changes as well. In developing family stories be sure to look at old Post Cards to see a view of the world your ancestor might have known. So you see, you could buy this kind of time machine on Ebay!